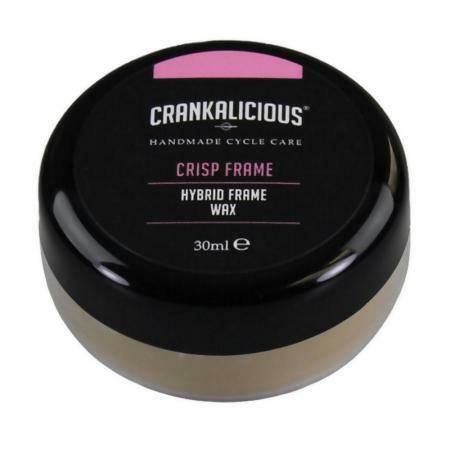 Crisp Frame from Crankalicious is a hybrid frame wax/sealant designed to be applied to a perfectly clean frame to keep it looking that way for months. Once your frame is spotless, the Crisp Frame Wax will impart a durable, glossy shine, whilst filling in and masking small imperfections. 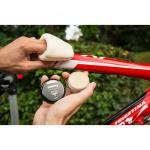 Rain and mud will also find it much harder to stick to your bike after Crisp Frame has been applied. Available in a 30mL jar, but don't be fooled by its small size. This jar contains enough wax to apply dozens of layers on a typical frame, and each layer may last 4-6 months before reapplying is necessary. Best applied with the Crankalicious Digit Mitt.